Sao Paulo (AFP) – Sao Paulo protesters clashed with police who used tear gas and sound bombs to disperse crowds, as thousands rallied against Brazil’s latest round of bus fare hikes. Police resorted to force after part of the march veered from its authorized route, and also arrested one member of the anarchist Black Bloc group, whose radical members took position at the front of the crowd. 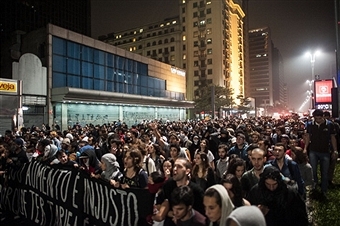 Organizers said the protests, called after authorities increased bus fares by 0.50 reais (20 US cents), brought together some 20,000 demonstrators. Authorities said the number was closer to 3,000. “It went as usual: the people demonstrated peacefully and the police throw gas,” Isabella, a 22-year-old law student, told AFP, wiping sweat off her face after running from police. About 1,000 police officers monitored the rally, with part of the demonstration regrouping to carry on after the encounter. Protesters also called for free student fares. The rally, called by the Free Pass movement, which also convened protests one week ago in Sao Paulo and Rio, is best known as the force behind 2013 protests that spread nationwide just as the Confederations Cup, a dress rehearsal for the 2014 World Cup, was getting under way. “The rising price of transport is inconsistent with life conditions in people’s daily lives in Brazil and is more in response to private interests’ wishes,” Joseph Reichmann, a student, told AFP. The protest came as Latin America’s largest economy is suffering from a marked economic slowdown, ending 2014 with 6.41 percent inflation and facing a fifth straight year of low growth.